Just how good are over the top accessories? Necklaces the size of your entire head, bracelets that cover half of your arms and, yes, funky glasses giving the impression you will take off any second. I loved just how everyone jumped on the bandwagon and fancyed these glasses: from magazine editorials to public appearances, these were everywhere! They seem pretty much to be the correspondent of the Louis Vuitton bunny ears (reviewed here). If you're still hesitating between showing love and hate, it's completely understandable. For back and portrait views, click on each image! I kept this until the end. 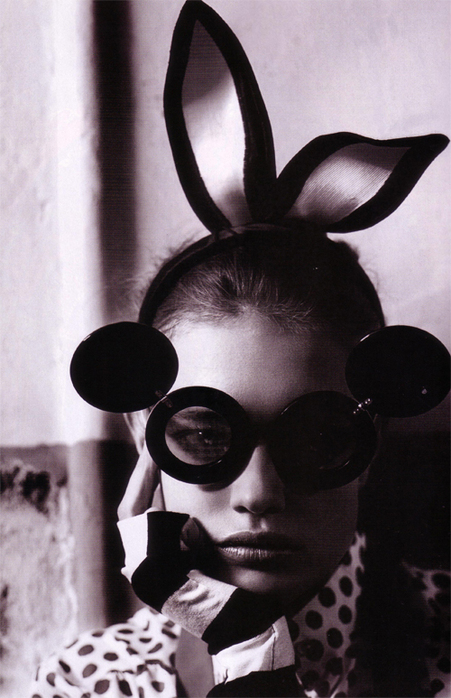 It's my personal favorite photo with the Jeremy Scott glasses, worn by Natalia Vodianova (photographer Mario Testino for Vogue UK May 2008).